Triple your onsite visits and double your leases with the leasing and marketing secret weapon that never clocks out. Capture More Leads. Spend Less. This is no ordinary apartment leasing call center service. The RealPage® Contact Center works around-the-clock cultivating the premium leads that convert to more leases, and acting as a natural extension of your leasing and marketing team—and your brand. Hundreds of RealPage Contact Center leasing agents undergo four weeks of intense training to become one of your biggest competitive advantages, fielding prospect inquiries and maintenance requests when your leasing staff cannot, responding to calls, online chats, and emails 24/7. Never miss a call. Never miss an opportunity. Up to 60% of potential leads could be going to voicemail. 40% of leads result in scheduled visits. 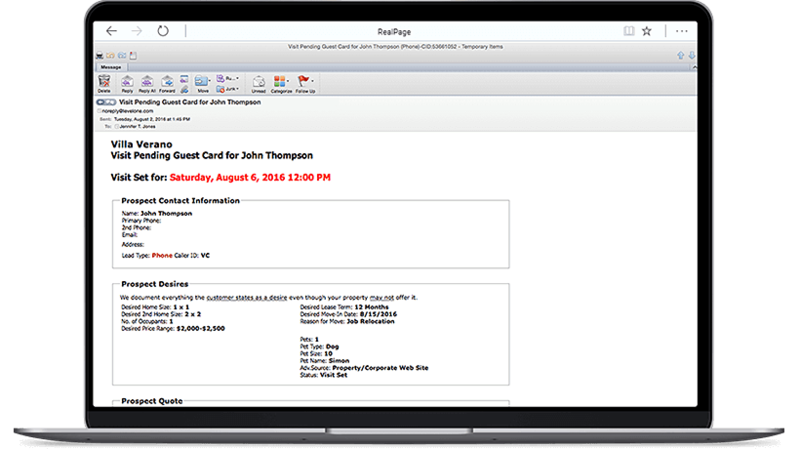 Sign 2.7 times more leases with RealPage Contact Center. More than half of the NMHC top 50 property management companies rely on the superior customer service of the RealPage Contact Center. Explore more and find out why. Our leasing agents respond to every email, phone call, and chat message—whether it’s a resident with a maintenance issue or a leasing prospect—with a friendly, engaging attitude designed to build relationships. Our robust technology helps ensure quick response by instantly routing service requests, after-hours emergencies, and new sales opportunities to the phones and devices you choose. We get it. As a recognized industry expert in on-demand software and software-enabled services for several rental housing industry markets, RealPage is uniquely qualified. Because your site staff can’t always be waiting by the phone, we offer Answer Automation, designed to instantly route service requests, after-hour emergencies and new sales opportunities to the phones and devices you choose. Incoming messages are automatically answered, clearly and professionally, and routed to up to nine numbers. Calls can also be automatically recorded and sent to your email inbox with caller ID, so your staff doesn’t have to search for the call back number. Our 24/7 contact service extends to onsite maintenance, making the response to residents—emergency or otherwise—instant and professional. This integrated service automatically and consistently enters service requests into your property management system, automates dispatch to proper personnel, monitors ticket volume, response time, and trends, and can even listen to calls between agents and residents, not to mention contact the resident directly when needed. Optimize your leasing performance with RealPage® ILM Lead Manager—a comprehensive lead management software solution that helps multifamily organizations increase revenue by focusing on leasing activities that produce the most value. Lead Scoring supplements your traditional leasing data, providing you with powerful analytics that identify actionable opportunities. This easy-to-use tool will help your team prioritize tasks that drive the most value by organizing work based upon activities that lead to the highest conversion rates. Watch this solution overview preview of the RealPage Contact Center, offering leasing and maintenance call center services to property management companies. More than an apartment answering services, our Contact Center engages callers, schedules on-site visits, and helps you sign more leases quicker. Inspired by the next generation of renters, who want instantaneous answers, Morgan Properties wanted to drill down to focus on building and providing prospects with the information they want, without all of the noise. In RealPage Contact Center, they found a true partner that was willing to engage with them in both discovery and execution of a strategy that provides exactly what prospective residents are looking for. Enlivant Vice President of Marketing, Rich Scarle had the opportunity to visit the RealPage Senior Living Contact Center and liked what he saw. In these representatives, he saw kindred spirits to his own Senior Living call center agents. They not only had all of the information they needed to help callers make an informed decision to set up a tour about his facilities, but he also saw genuine empathy for what the families were going through when selecting a senior living facility. RealPage Contact Center is always on brand, creating more qualified on-site visits. How we share your apartment leasing goals when using RealPage Contact Center services. RealPage Contact Center makes sure JVM Realty is always there to answer the call.